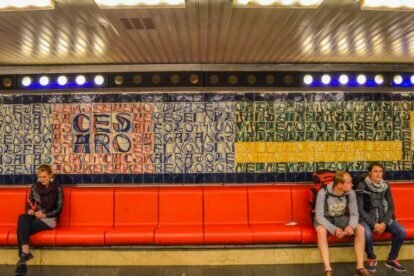 In the way station ‘Deák tér’ of subway 3 you can read poems on the wall. The poems by Hungarian poets are written in Portuguese and the Portuguese poems are written in Hungarian. The tiles are the works of Portuguese painter Joao Vieira. I have to admit, though, that it was a challenging spot: looking for the poems took me a lot of time and not with much success at first, since a number of tiles were badly laid out in some places. It was still a good game though, and a very interesting work of art with beautiful poems. In general it’s a free thing, but you have to have a ticket for the subway to come here :(. ATTENTION: SUBWAY3 IS UNDER CONSTRUCTION!